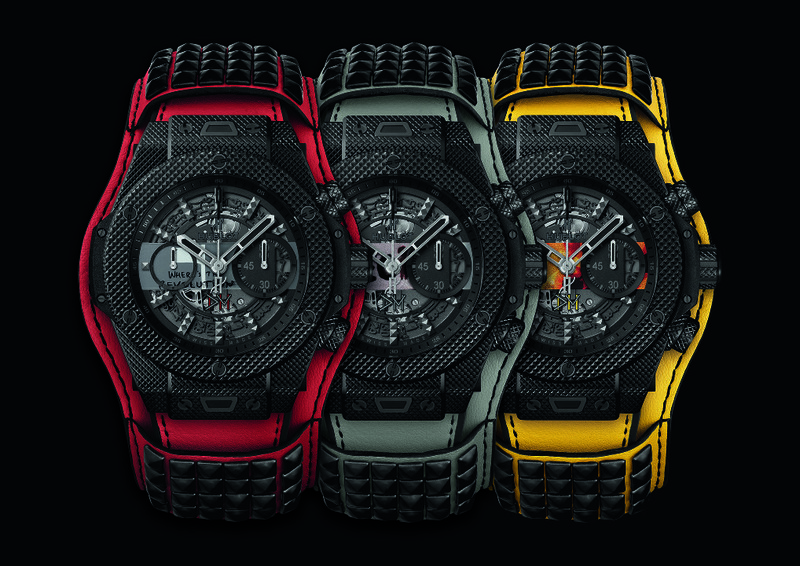 TAG Heuer launched two special series in honour of the famously unconventional Formula 1 team Red Bull Racing. Back in December 2015 TAG Heuer became the Official Timekeeper & Official Watch of the Formula 1 Red Bull Racing team in a landmark agreement. 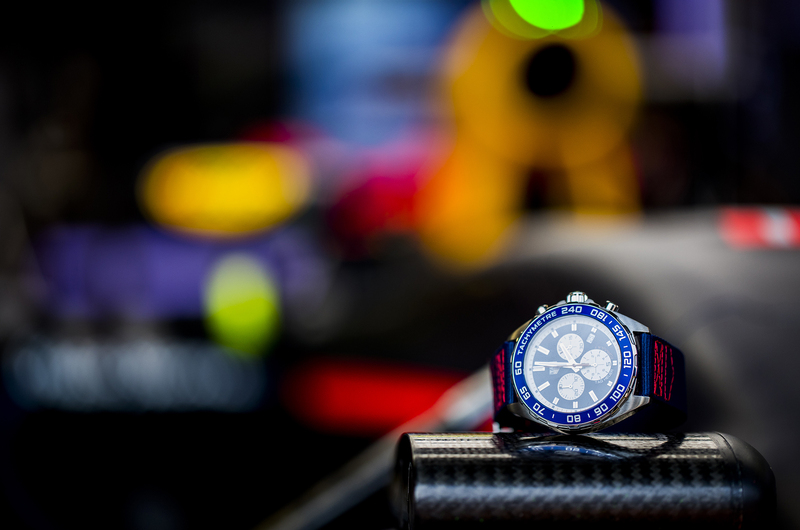 The two brands announced the new name of the 2016 car “Red Bull Racing – TAG Heuer RB 12”, with the watch manufacturer being included in the team’s official name. It’s the first time a watchmaker has ever been named directly in the official title of an F1 team. Red Bull Racing has amassed four Double World Champion titles, having won the FIA Constructors’ and Drivers’ titles four years in a row. However, it was Red Bull Racing’s unorthodox approach to the sport and to to entertainment in general wich appealed to TAG Heuer, one which is perfectly in line with the brand’s new marketing strategy. Now, at the most glamorous of all Formula 1 Grand Prix events (no, there’s no doubt about that) – Monaco – and to celebrate its first year of partnership with the most unconventional team in the Formula 1, TAG Heuer introduced two special series TAG Heuer Formula 1 Red Bull Racing Team watches. The steel chronograph bears the team’s colours – midnight blue and red – an alliance which naturally alludes to the racing mindset. 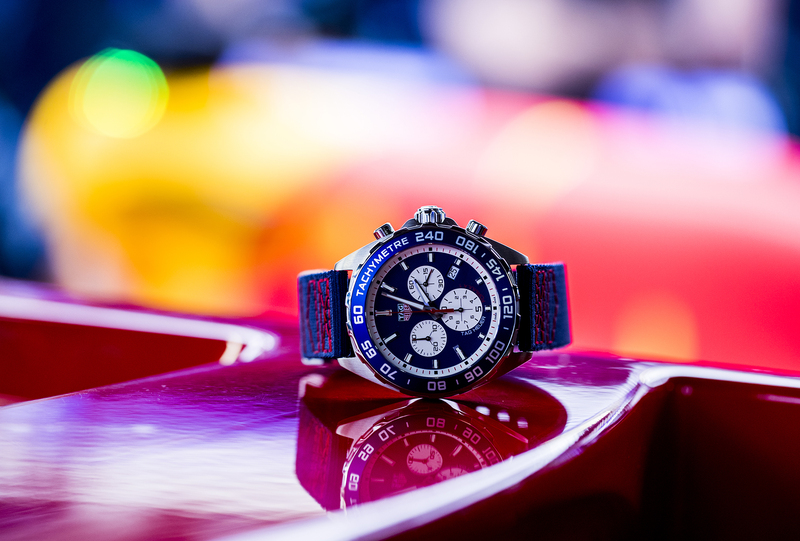 Adorned with a bezel sporting a tachymeter scale in matte blue aluminium, this piece truly reflects the DNA of the TAG Heuer Formula 1 collection. Inside works a quartz chronograph movement, the Ronda 5040D with the 1/10 second and hour counter at 6 o’clock, a minute counter at 9 o’clock and the current seconds counter at 3 o’clock. The hands are red, matching the team colours, while complementing the white counters and deep blue case. The case back is engraved with the legendary black and white chequered flag, a symbol of Formula 1, as well as the Red Bull Racing Team logo. 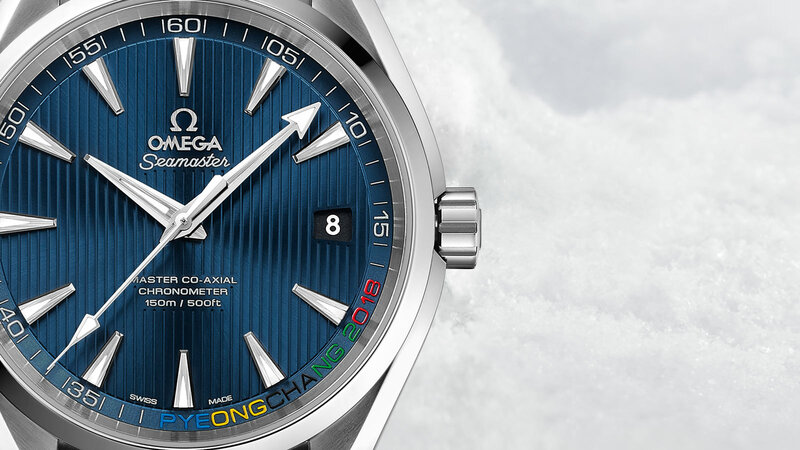 The watch is water resistant up to 200 metres. 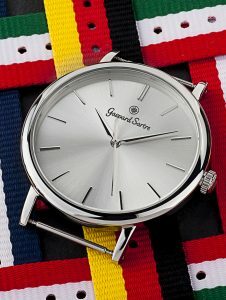 The watch is available in two versions, one of which has a steel bracelet in keeping with the brand’s flagship models. 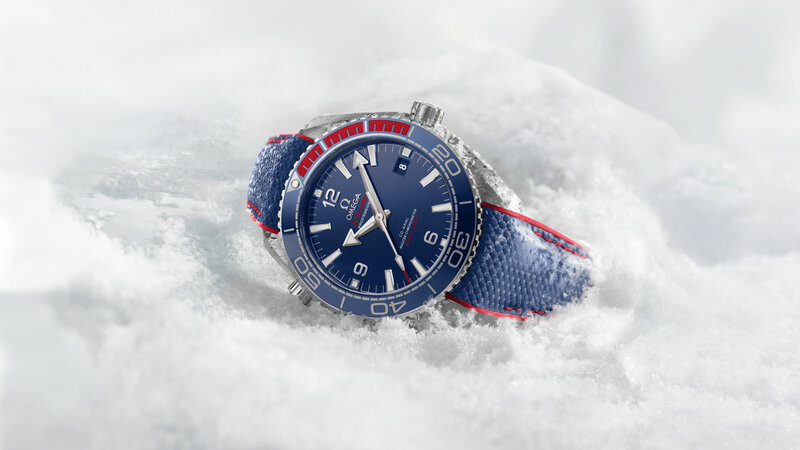 But the model is also available with a strap made from technical textile for a sportier look, with red stitching inspired by the seat belts of racing cars. 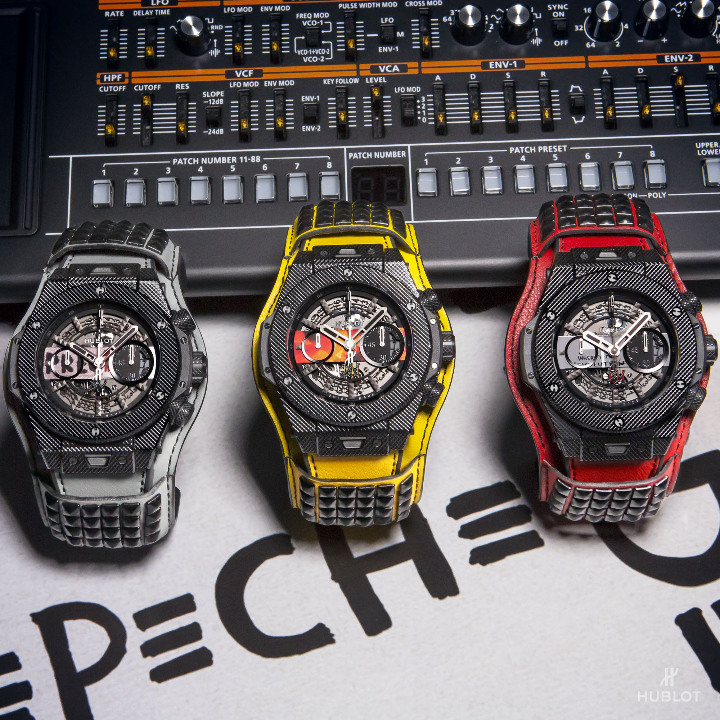 So there’s nothing much new here and calling a watch two special editions that only vary in terms of the strap is a bit of a stretch we would say. 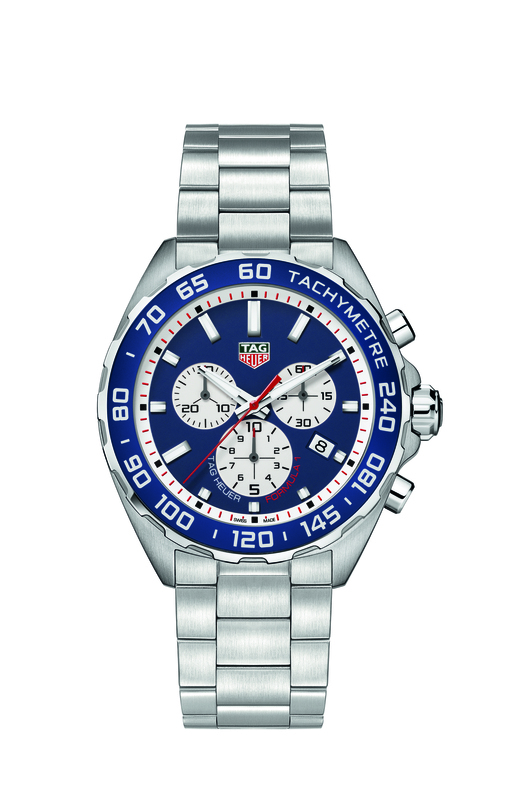 But: Nonetheless, these watches are perfect for people who prefer a bit of colour on their wrists and of course they are high-quality like one would expect from TAG Heuer. This spring, Speake-Marin unveils a special edition dedicated to the early years of the British watchmaker peter Speake-Marin. The London Chronograph is a special edition and it will only be available in the Fine Watch Room at Harrods, in London during this summer. After qualifying as a horologist a London’s Hackney College and deepening his knowledge of watch making in Switzerland, Peter Speake-Marin met Georges Somlo in 1990. Speake-Marin stayed in Somlo’s Piccadilly arcade for six years, restoring al manor of early pocket and wrist watches. The London Chronograph is a tribute not only to this years but also to the watches Speake-Marin learned to love back then. 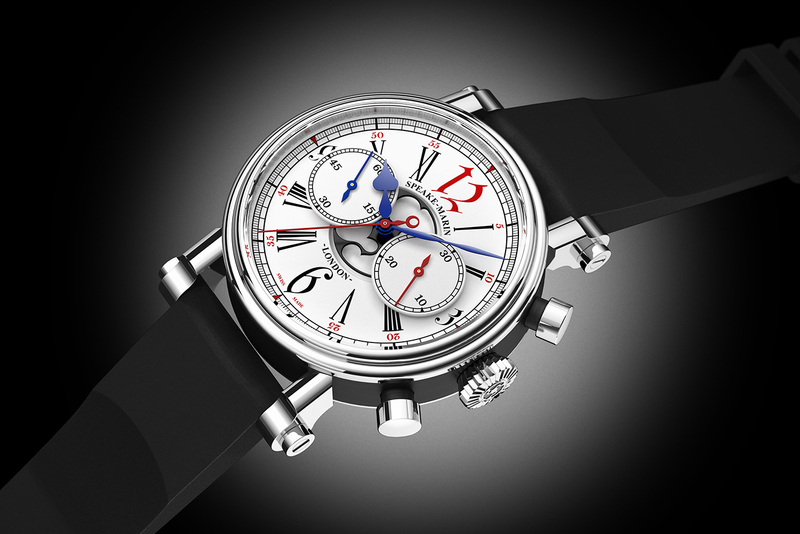 The chronograph is powered by a Valjoux 92 made during the 1950’s and 60’s. As with many mechanical calibres the quartz revolution in the late 60’s cut short the life of this and many other calibres. Therefore today these calibres are rare and it was chosen by Peter Speake-Marin because it is the same type of movement he had restored during his time in London during the 1990’s while working with Georges Somlo. The Valjoux 92 succeeded the popular Valjoux 23 family. It was similarly sized but used a different technology. It was an oscillating pinion design, distinct at a glance for having two rather than three chronograph engagement wheels visible at the back. The historical chronograph movement were used by companies like Patek Philippe, Rolex and TAG Heuer. The mechanical hand wound movement beats with 18.000 beats per hour and features a power reserve of approximately 40 hours. 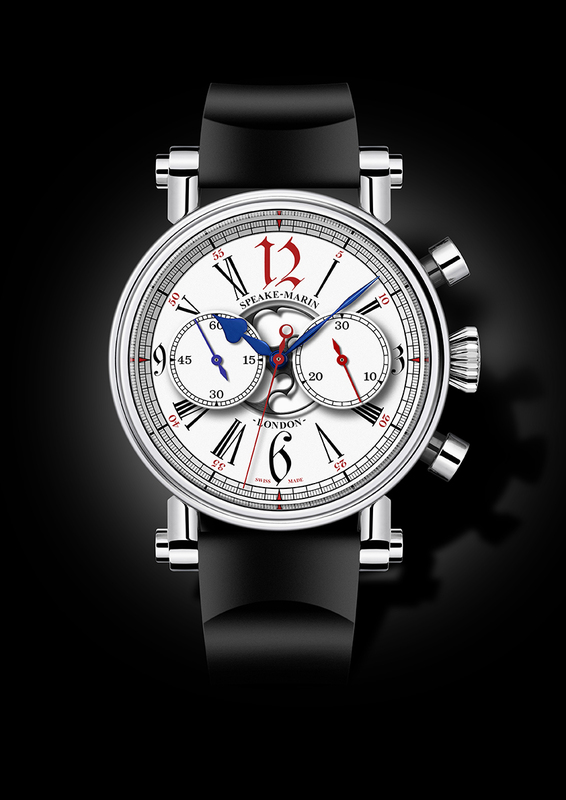 The London Chronograph is housed in a 42 mm titanium case with a three dimensional white dial. On the dial, the Arabic numbers alternate with Roman numerals to bring a vintage touch. 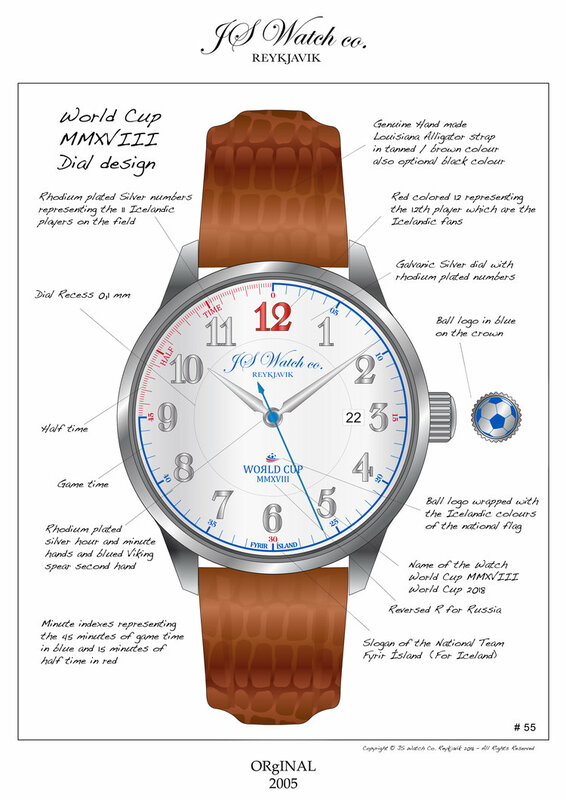 The red 12 has classical connotations and associations with early pocket and wrist watches made in England. The centre seconds chronograph is married in color to the 30 minute recorder hand located at 3 o’clock on the dial. The two subsidiary dials for the 30 minute recorder and the seconds dial are both seen to float on the dial and below them is found the Speake-marin topping tool logo wheel fitted to the hour wheel turning with the hour hand. The Central Speake-Marin signature Foundation style hands in heat blued steel bring the final touch to this special edition. The London Chronograph is equipped with a black rubber strap and water resistant up to 3 atm. It will only be available the coming summer like mentioned before and it’s priced at £14.400. Gaspard Sartre, known for its beautiful, minimalistic watches, just introduced new bracelets to extend the current collection – and the colours are what every football fan dreams of. 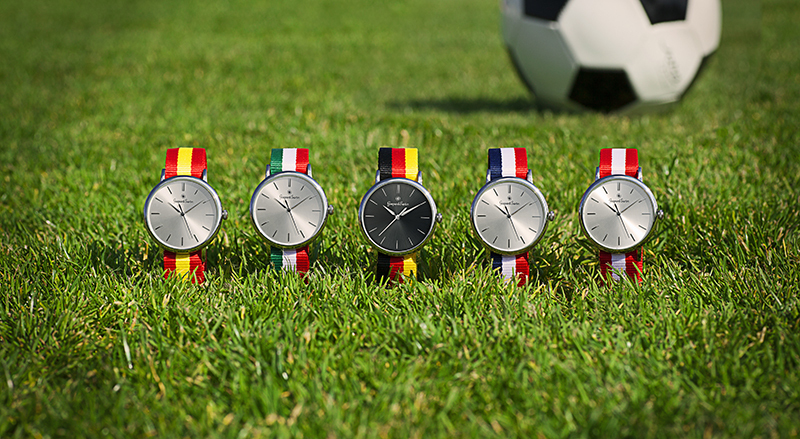 One to support your national football team, one to support your favourite club, ten different colour combinations to switch and mix with your favourite watch. We’re sure these brightly coloured bracelets will quickly find admirer and fans. The Gaspard Sartre football collection features the national colours of Brazil, Spain, Italy, Germany, France, the UK, Switzerland and Austria. Additionally you can also find some club colours. 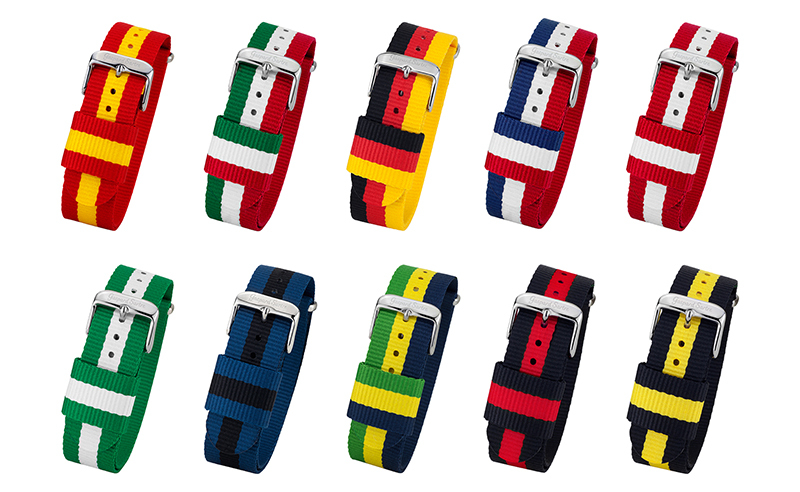 Regardless of the national colours you choose to wear, which club you support, if you’re watching in the stadium or at home – the new colours are standing out on the wrist. And of course they are not only great for football fans. You don’t like football at all? No problem. Nevertheless somewhere within this collection of bright coloured bracelets you will find the right colour-combination that fits your taste. All the new bracelets can – like every other bracelet from Gaspard Sartre – be bought without a watch. You can choose between two different widths (18 millimetres and 20 millimetres) suitable for the watch you already have at home. Every bracelet of the Gaspard Sartre Football Edition is equipped with a stainless steel clasp. The Radiomir 1940 10 Days GMT Automatic Oro Rosso 45 mm is an exclusive Special Edition where the beauty and simplicity of the case is combined with the P.2003/10 in-house movement. The case of the watch is immediately recognisable by its lines of exemplary simplicity, a testimony to the purity of Italian design of the 1930s and 1940s, is made of red gold, and is 45 mm in diameter. The brown dial has an elegant satiné soleil finish and an impeccable aesthetic balance which enables all the functions of the watch to be read immediately and clearly. 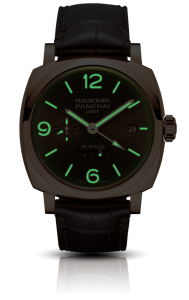 The structure of the dial is the classic sandwich, invented by Panerai to provide the maximum visibility and legibility of its indications even in very low light conditions: two superimposed discs contain the luminous material which shines through the holes made in the upper disc, which correspond to the dial markings. The brown dial is sun-brushed and showes the date at 3 o’clock, the 24-hour-indicator at 8 o’clock and a linear power reserve indicator at 6 o’clock. It is protected by a sapphire crystal formed of corundrum. 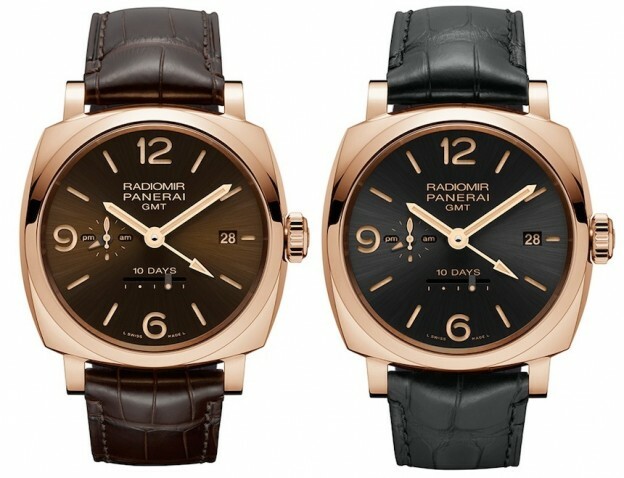 The automatic mechanical P.2003/10 calibre is executed entirely by Panerai. With a diameter of 31 mm and three spring barrels which give the watch a power reserve of ten days, the movement has 25 jewels and a balance spring which makes 28,800 vibrations per hour. 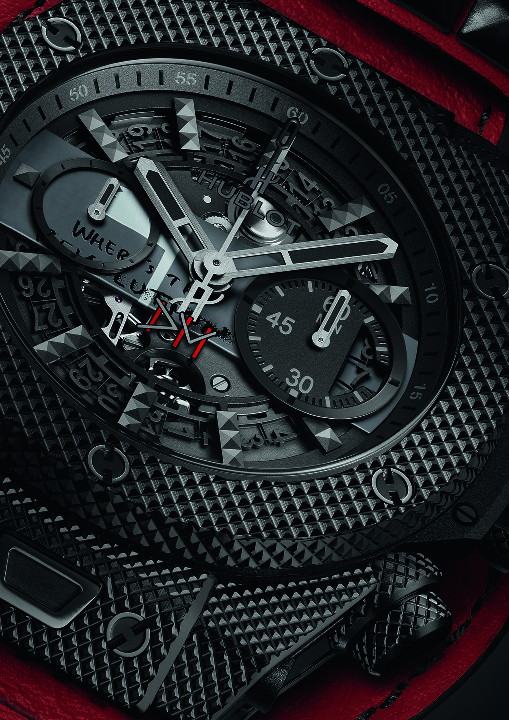 The main functions are hours, minutes and small seconds, date and linear indication of the remaining power reserve. 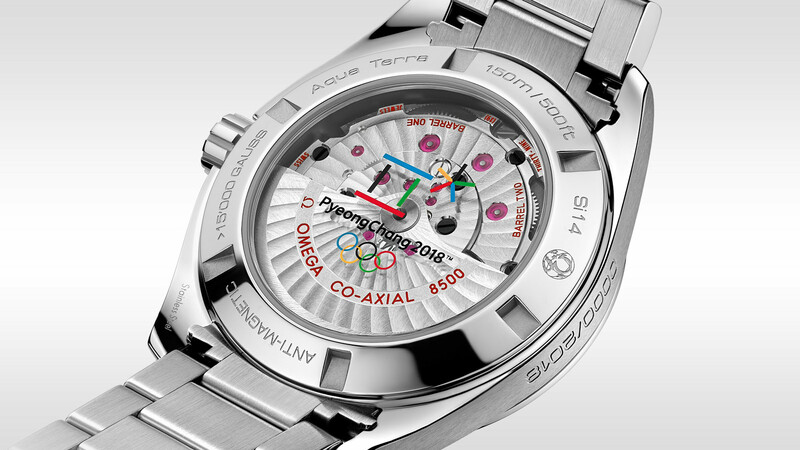 The back of the watch is made from see-through sapphire crystal so the amazing movement can be observed while working. The Radiomir 1940 10 Days Automatic is supplied with a brown alligator strap. 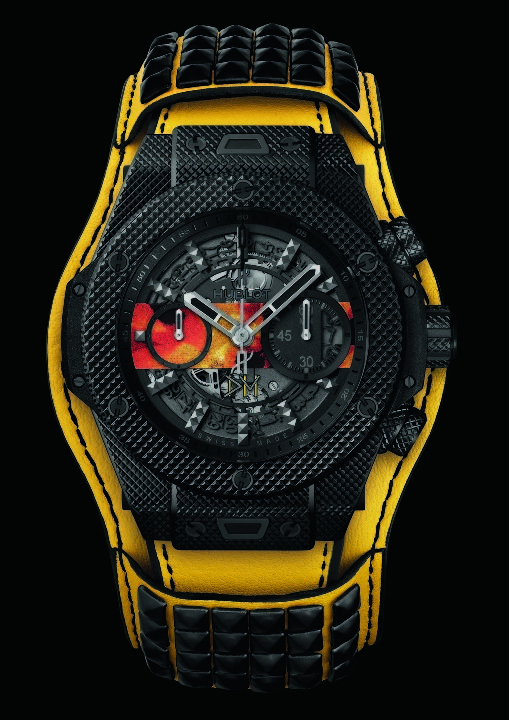 The case is water-resistant to 5 bar – a depth of about 50 metres. 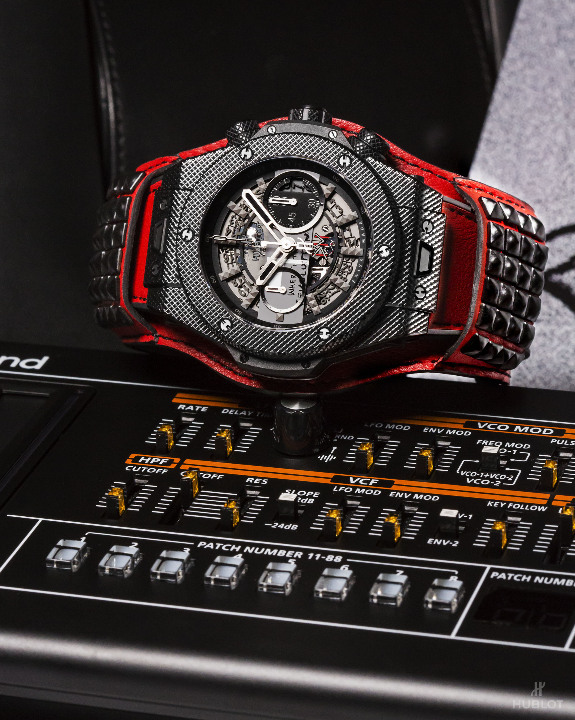 When you desire one of these gorgeous watches you’ll better be quick – there will only be made 150 units. The good news: In black as well, and that makes 300 in total. Shinola builds watches from Swiss components in an attempt to bring high-end manufacturing back to the United States. As we all know, “The Runwell” is Shinola’s flagship watch. It’s about time we say a few words about it and the new special edition presents a perfect opportunity to do so. With the 4th of July coming up, Shinola presents a new model of The Runwell to celebrate this holiday. The new Runwell “White Watch” features the American colors, that are so proudly presented all over the country when the 4th of July celebrations are taking place. 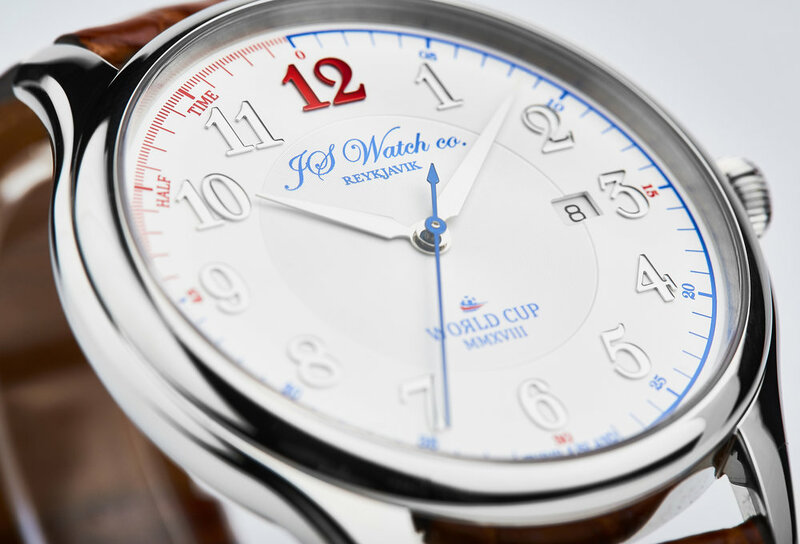 The dial is white, the Arabic numerals and the markers as well as the dial of the small second are blue and the leather strap is red. The Runwell shows hours, minutes and a small second – no date. A clear and classic design without much garnish. 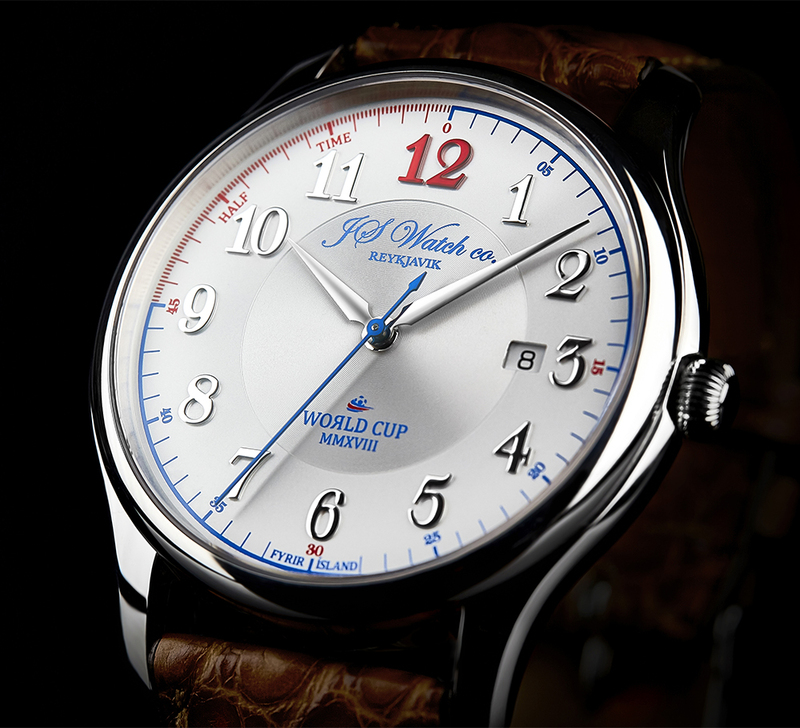 The numerals and markers are slightly raised and look great on the crisp white dial. The design of the dial is rather plain, which makes it all the more legible. 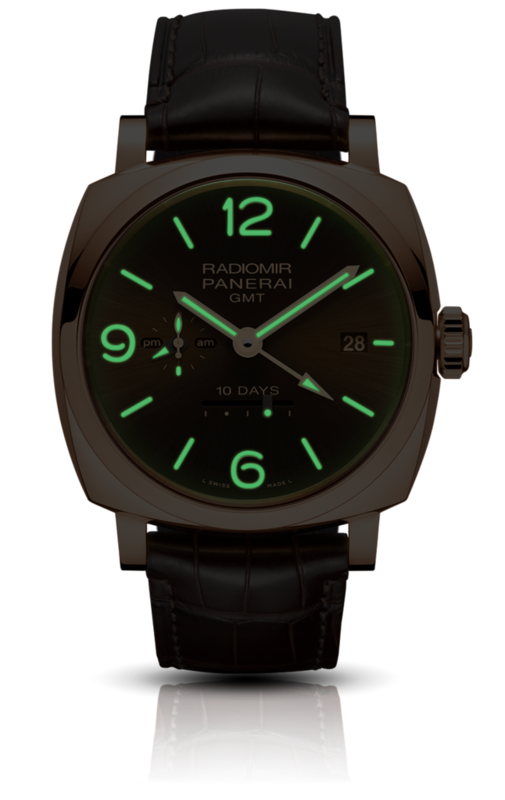 The hour- and minute-hands and have gracefull curves and are painted with Super LumiNova, giving them incredible luminance in the dark. Like on the regular Runwell models the second’s dial is placed at 6 o’clock. The lightning bolt, which is normally in orange, is on this particular model red, to fit the theme. This applies also on the two other lightning bolts on the crown and the buckle. The Runwell has a domed sapphire crystal that is appropriately retro and plays nicely with the curved bezel. The crown screws into the body to prevent accidental adjustment. The engine of the Runwell is the Argonite 1069 quartz movement. It is hand-assembled from 46 Swiss-made components (Ronda AG) but manufactured in Detroid by a dozen or so watchmakers. Although many people would like to see Shinola producing an automatic or even mechanical movement, working with quartz allows Shinola to keep their products at an affordable price point. The case is 41 mm in diameter and therefore suitable even for smaller wrists. Since the case is built from stainless steel, the watch is quite heavy. 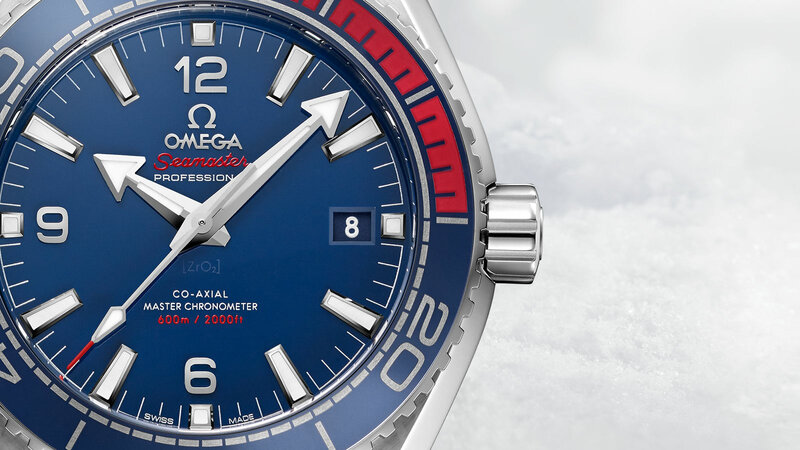 But it fits perfectly and quite comfortably on the wrist; it has the satisfying weight that immediately makes you believe in the quality of the object you’re dealing with – solid, bold and fearless. The case back is clearly a reference to the automobile industry (which Detroit is known for) with a stamped metal. 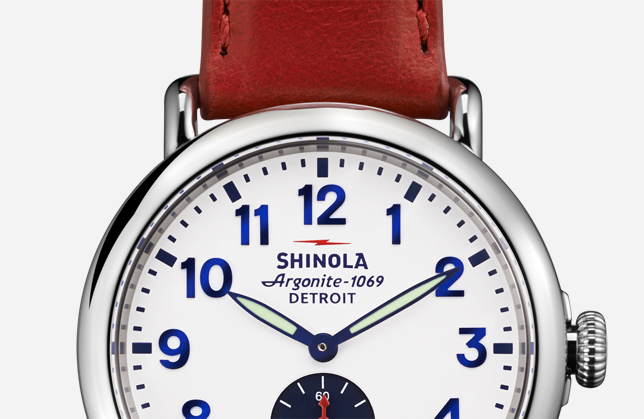 Like all Shinola products, each piece has a unique serial number displayed there, emphasizing the limited production numbers of the watch. You’ll also find four screws pushed all the way to the edge of the backing. The Horween Essex Leather strap is made by Hadley-Roma in Lago, Florida. It’s nice and thick to balance the heft of the solid-steel watch. It is hand-stitched.